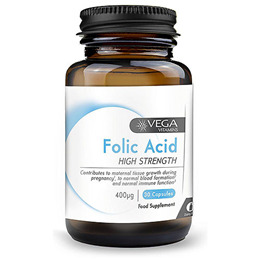 Vega Vitamins Folic Acid Vitamin B9 is a production of DNA and RNA, required for the formation of red blood cells, brain function, the immune system and a healthy heart. 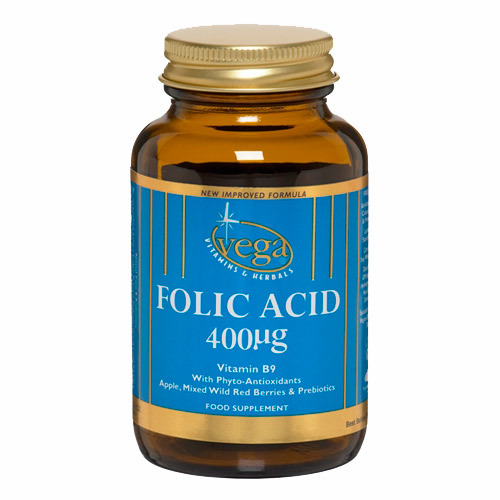 Folic acid has a rapid synthesis of DNA which is required during periods of growth in infancy, adolescence and pregnancy. As well as helping divided cells in the body; bone marrow, digestive tract and skin tissues. Vega Phytoantioxidant Base, Vegetable Capsule Shell (hypromellose, Water, Natural Colours, Copper Chlorophyllin, Titanium Dioxide), Vegetable Magnesiums Stearate (Lubricant), Folic Acid. Below are reviews of Vega Vitamins Folic Acid Vitamin B9 - 90 Capsules by bodykind customers. If you have tried this product we'd love to hear what you think so please leave a review.